Across the western US today thousands of firefighters battle 19 active wildfires, on the ground, from the air, under thankfully improving weather conditions. Our thoughts with them. And to our readers once more we recommend Young Men and Fire by Norman Maclean (University of Chicago Press, 1992). 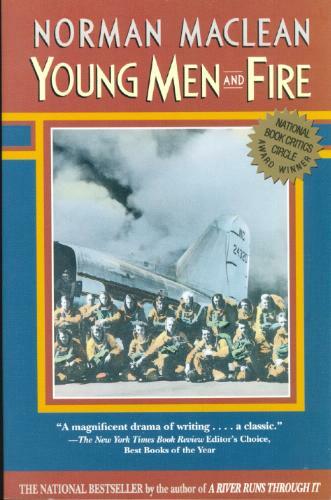 It's so much more than a gripping history of the 1949 Mann Gulch tragedy, in which a crew of elite smokejumpers got caught in a blowup. It's also a detailed explanation of how wildfires work, a fact-filled commentary on what the firefighting community learned and how it changed its approach to fighting wildfires in the last half century, and a personal memoir about living and dying. You won't find much better nonfiction prose anywhere. Maclean also wrote A River Runs Through It and Other Stories. We suggest Young Men and Fire as Further Reading on our smoke inhalation page. We recommend it again here for what's shaping up to be another memorable season of western fires.